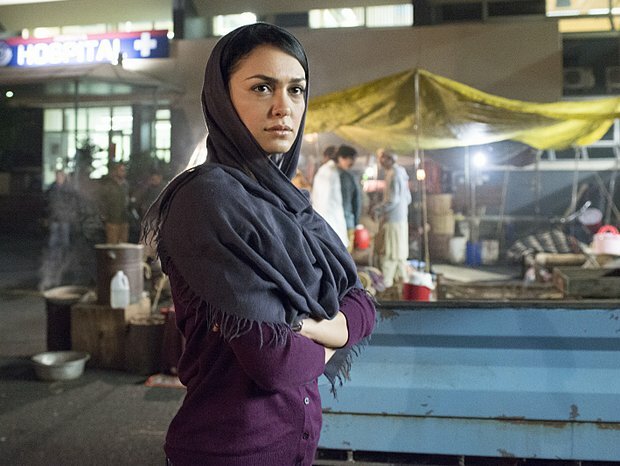 Nazanin Boniadi plays analyst Fara Sherazi on Showtime's Homeland. The show&apos;s latest winner, Nadiya Hussain, spent weeks whipping up traditional British pastries such as cream horns and iced buns, all while wearing a crisp white apron and a traditional black headscarf. "Nadiya has brought something special to The Bake Off," raved judge Paul Hollywood during the show&apos;s October finale. "Her ideas have flair. Her emotion, her passion were all in her bakes. She just nailed the whole final and that was the best tasting final we ever had." Hussain&apos;s win was widely seen as a triumph of British multiculturalism. And by regularly showing a headscarf-wearing Muslim woman outside the context of hate crimes, terrorism or politics, The Bake Off is part of a small but significant shift in how hijab-wearing women were represented on TV in 2015. Across the Atlantic, Muslim women in headscarves competed on two American reality shows: Fox&apos;s primetime series Home Free, in which contestants help build houses, and MasterChef. MasterChef contestant Amanda Saab is the daughter of Lebanese immigrants and wears a hijab. She didn&apos;t take the MasterChef title, but she says her personal win was just getting a chance to be herself on national TV. She cracked jokes, showed her creative side and even cooked bacon as part of a breakfast challenge. "And that wasn&apos;t highlighted at all in that episode, but for me it was huge," Saab says. "I mean, for me it was the first time I cooked bacon." Saab didn&apos;t actually taste the bacon, even though she prepared it. She says she had decided to use any items thrown at her in a challenge, even ones Muslims are supposed to avoid, like pork and alcohol. Evelyn Alsultany, author of Arabs and Muslims in the Media: Race and Representation after 9/11, says good-humored, relatable people are far removed from the two kinds of hijab-wearing Muslim women usually depicted in scripted television. "Terrorist or CIA agent," she says ruefully. "Usually, if there is a character wearing hijab, it&apos;s one episode and you&apos;ll blink and miss it." But Alsultany has recently seen a few hijab-wearing characters who are featured supporting players —inevitably, both are in dark, terrorism-related dramas. ABC&apos;s Quantico has twin sister FBI recruits and the Showtime drama Homeland featured an analyst whose hijab made her boss suspicious. In a show that also portrays Muslims as the enemy, Alsultany says theHomeland role also lacked nuance. "She is portrayed as a hyper-patriotic woman," she says, "and that is her function." Ultimately, Alsultany finds this good-bad binary dehumanizing. "It just also reveals how basic the level of conversation [about Muslims] is ... in this country," she says. But she also saw something new this year: a hijab-wearing character in a scripted drama that hasnothing to do with Islamic extremism. Mr. Robot, on the USA Network, is about computer hackers, and one happens to be a young woman in a headscarf. Alsultany hopes 2016 will bring more three-dimensional Muslim characters to our screens — including ones in headscarves.